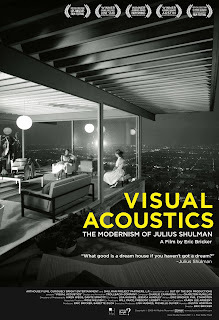 Narrated by Dustin Hoffman, Visual Acoustics is the story of Julius Shulman, the world’s greatest architectural photographer,who died in July of this year. 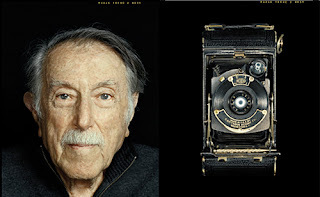 Shulman photographed nearly every well known architect's creations, beginning in the early 1930s. Modernism draws on the formula that form follows function meaning that the form of a building or object should be foremost based upon the function or purpose for which it is intended. Interestingly, though this would seem to always makes good sense, often there are aesthetic issues, the form of an object and its intended purpose is not by itself a entire design solution. If only the film itself had followed this formula. Shulman is shown as shallow and doddering, vain about his accomplishments and connections. Shulman's single point perspectives epitomized the pure beauty of Southern California's modernist movement and brought its iconic structures to the attention of the American public. Each image seems to command the light and shadow around it. A naturalist, educator, lifestyle propagandist and commentator on urban form he once said "every part of a persons life is based on an architect's presence." 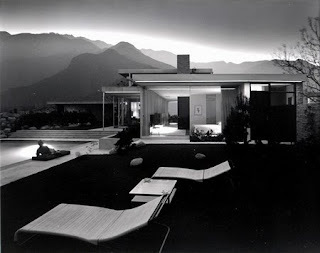 The movie features Shulman revisiting homes he photographed decades ago including the Kaufmann House by Richard Neutra, and an elegant angular glass house by Pierre Koenig perched high in the Hollywood Hills. Shulman himself does come off well in this film. Depicted as hyper, narcissistic and dismissive, the director films only a shell of person. Early in the film there is a brisk stop-animation chronology of his influences, friends, relations, and students. 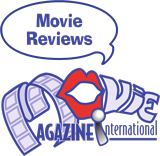 It goes by quickly, explaining the roles of no less than 20 people in two minutes, it feels like padding for a movie that is unmistakably for the post modernist "in the know" crowd. Director Eric Bricker skims over Shulman's life, showing him as stubborn, but somehow free of discord, the ends don't match up. Visual Acoustics won the Mercedes-Benz Audience Award for Best Documentary at the Palm Springs International Film Festival, and several other film festival awards. Director Eric Bricker once turned his focus toward film and television production where he worked with such notable talent as Jerry Seinfeld, and his inspired "show about nothing," translating that ethic into full blown documentary style. Even as a historical documentary I found this film unbearable. Poorly photographed and edited, with forgettable droning music, I needed to pinch myself to stay awake. If you are an architect, a photographer, or any combination thereof, this movie might educate you of your roots, but for me as a slice of entertainment or edification it left a dry aftertaste.